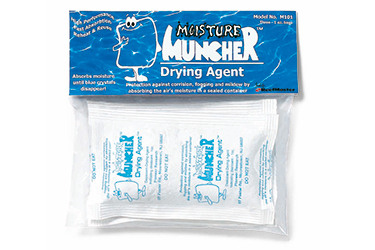 Moisture Muncher Packs absorb moisture to prevent fogging and corrosion of your valuable electronics and cameras. Use inside an airtight storage case or container to create a perfect dry environment for your valuable items. Each bag contains one ounce of powerful moisture absorbing granules and color indicating crystals. When crystals turn from blue to pink color, it’s time to replace the bag.